Fermata Nowhere members sing Dancing On My Own, by Calum Scott, arr. Robin, at their first rehearsal with the addition of newly auditioned members on September 21. Pictured from left to right is Nicole Plummer ‘19, Megan Mitchell ‘20, Emily Fox ‘22, Laurie Houvener ‘19, Katie Marsano ‘22, Lia Eisenberg ‘21, Erin Moynihan ‘19, Rachel Delong ‘22, Sam Price ‘20, Caroline Pack ‘19, Evan LaFrance ‘20, Daniel Delong ‘19 and William Scales ‘22, with Anna Musteata ‘22 as the rehearsal pianist. 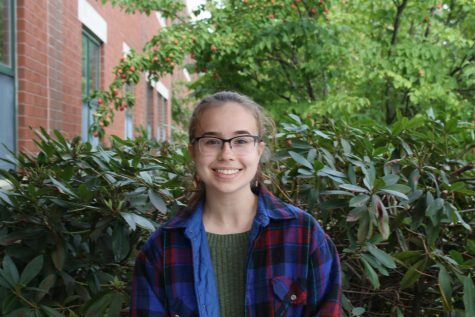 “I felt like we sounded really good and it’s nice to be with a group of people who know what they’re doing and they’re all really really good singers,” said Emily Fox ‘22. Walking through the halls of Hollis Brookline High School early in the morning on a PLC Friday, you may hear distant voices singing and humming from the choir room. That’s the sound of Fermata Nowhere, HBHS’s student-led a cappella club. The club has regrouped and refocused for another year of music-making. Complete with fifteen members, the group has four sopranos: Nicole Plummer ‘19, Megan Mitchell ‘20, Emily Fox ‘22 and Laurie Houvener ‘19; four altos: Katie Marsano ‘22, Lia Eisenberg ‘21, Rachel Delong ‘22 and Julia Pepin ‘19; three tenors: Sam Price ‘20, Caroline Pack ‘19 and Evan LaFrance ‘20; three basses: Daniel Delong ‘19, Nick Bird ‘20 and William Scales ‘22; and one vocal percussionist: Erin Moynihan ‘19. The 2018-2019 school year has brought about some big changes for Fermata Nowhere, starting right at the club’s leadership. According to Moynihan, there’s generally a president and a vice president of the club, one senior and one junior. However, this year there are two co-directors, Houvener and Plummer, who are both seniors. These two have worked together, through the summer, planning how the year should progress for their group. It has been “a dream” according to Plummer. Some of these plans include an emphasis on group-wide involvement. “We’re trying to make it so that everyone else in the group also has a lot of say in what’s going on so it’s kind of a more direct democracy,” said Plummer. Auditions and rehearsals have strengthened the relationships between singers across the HBHS music community. “Even if they didn’t get in, it’s a really great way to just make connections with these kids and start to form a relationship,” said Plummer. Throughout this process, upperclassmen were able to work with the younger class’s vocalists and strengthen the ties between them. Fermata Nowhere has their sights on more than just concerts this year- community outreach is another key piece of the club’s activities under Houvener and Plummer’s leadership. After holding a workshop at the Hollis Brookline Middle School at the end of the 2017-2018 school year, the club is working towards developing a feeder program. 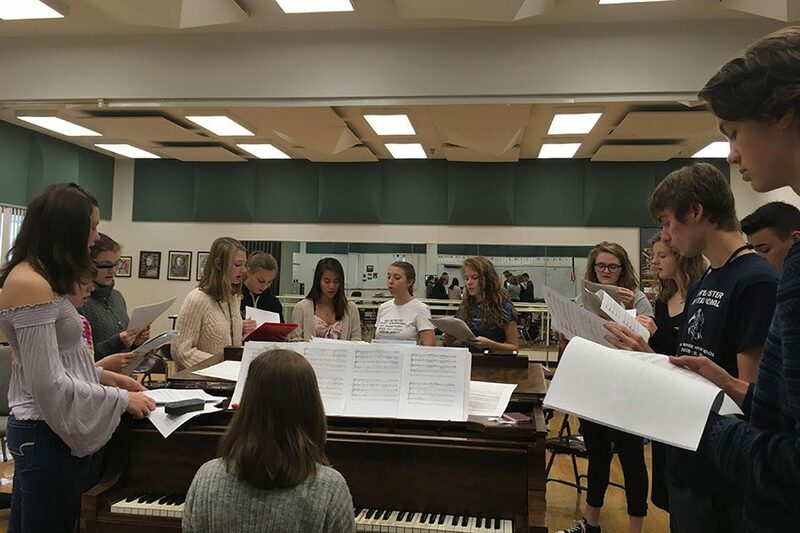 Fermata Nowhere is looking “to get [middle school students] interested in a new form of music because it’s a really good way to connect to people because we sing pop music instead of the classical choir music that they’re used to,” said Plummer. They also hope to partner with other musical groups such as Tri-M, the musical honors society, to provide music to other parts of the Hollis/Brookline community. To start the year off, Fermata Nowhere will perform the Pentatonix version of Dancing On My Own, written by Calum Scott and arranged by Robyn, as their first piece. After choosing the song last spring, the members are excited to perform it, especially with its showcase of vocal percussionist Moynihan. “Last year I only got to beatbox on one song and it was for like 30 seconds in a Christmas carol, but this year I’m actually doing it. I’m excited about that,” she said. Besides beatboxing, the piece also has intricate harmonies which, according to Plummer, suit the ensemble very well. With new members, new leaders, and new music, Fermata Nowhere is ready to take on the ‘18/’19 school year.